As I'm trying to give inspiration to different styles of crafters, today's style is very different from yesterday's card... This one is Clean and Simple, just trying to showcase the beauty of the papers. 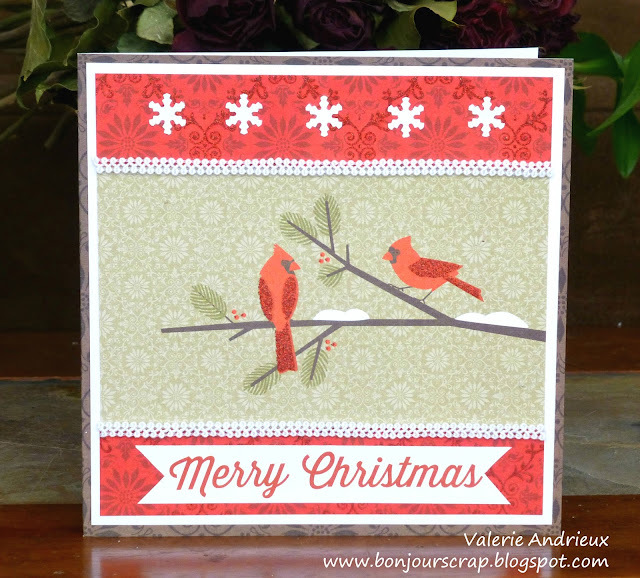 I used the Merry Memories stack by DCWV, with a little lace and small punched snowflakes. Love the glitter accent added to the cardinals ! It catches the eyes without overloading the design. We are two weeks away from Christmas, I will have a busy shopping day before heading my scraproom again for another card... I hope you will have a fun day and you will find you way back to my blog tomorrow ! Thank you for taking some time to see the card of the day ! lovely! good luck and have fun shopping! Shopping is almost done, thanks to internet ! Good luck with yours Jennifer !